Yesterday we joined The Dartmoor Society for their AGM. They describe their society as “An independent voice for those who find Dartmoor a source of livelihood or inspiration”. 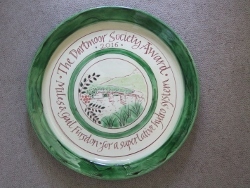 With this in mind we were thrilled to be presented with the 2016 Dartmoor Society Award. They have taken a keen interest in the development and maturing of our hydro-electric scheme from the beginning. The award is a huge honour, thank you!